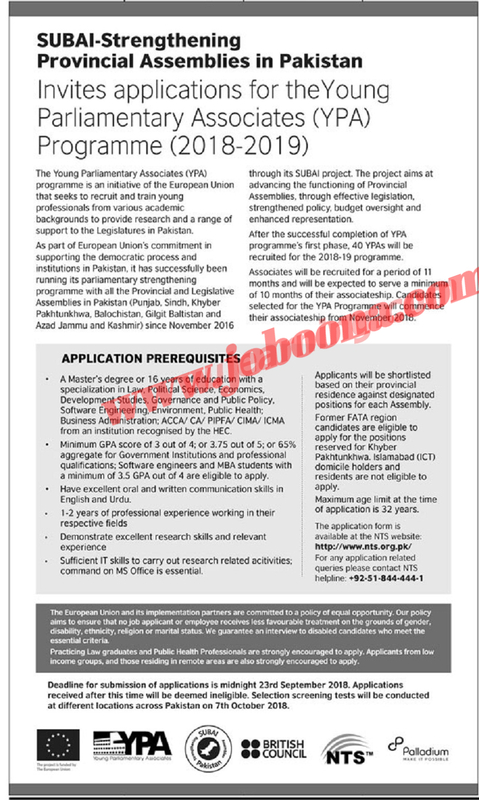 The Young Parliamentary Associates (YPA) programme is an initiative of the European Union that seeks to recruit and train young professionals from various academic backgrounds to provide research and a range of support to the Legislatures in Pakistan. As part of European Union's commitment in supporting the democratic process and institutions in Pakistan, it has successfully been running its parliamentary strengthening programme with all the Provincial and Legislative Assemblies in Pakistan (Punjab, Sindh, Khyber Pakhtunkhwa, Balochistan, Gilgit Baltistan and Azad Jammu and Kashmir) since November 2016 through its SUBAI project. The project aims at advancing the functioning of Provincial Assemblies, through effective legislation, strengthened policy, budget oversight and enhanced representation. After the successful completion of YPA programme's first phase, 40 YPAs will be recruited for the 2018-19 programme. Associates will be recruited for a period of 11 months and will be expected to serve a minimum of 10 months of their associateship. Candidates selected for the YPA Programme will commence their associateship from November 2018. The application form is available at the NTS website: http://www.nts.org.pk/ For any application related queries please contact NTS helpline: +92.51-044-444-1 Deadline for submission of applications is midnight 23rd September 2018. Applications received after this time will be deemed ineligible. Selection screening tests will be conducted at different locations across Pakistan on 7th October 2018. A Master's degree or 16 years of education with a specialization in Law, Political Science, Economics, Development Studies, Governance and Public Policy, Software Engineering, Environment, Public Health; Business Administration; ACCA/ CA/ PIPFA/ CIMA/ ICMA from an institution recognised by the HEC. Minimum GPA score of 3 out of 4; or 3.75 out of 5; or 65% aggregate for Government Institutions and professional qualifications; Software engineers and MBA students with a minimum of 3.5 GPA out of 4 are eligible to apply. Have excellent oral and written communication skills in English and Urdu. 1-2 years of professional experience working in their respective fields Demonstrate excellent research skills and relevant experience Sufficient IT skills to carry out research related acitivities; command on MS Office is essential. Applicants will be shortlisted based on their provincial residence against designated positions for each Assembly. Former FATA region candidates are eligible to apply for the positions reserved for Khyber Pakhtunkhwa. Islamabad (ICT) domicile holders and residents are not eligible to apply. Maximum age limit at the time of application is 32 years. The European Union and its implementation partners are committed to a policy of equal opportunity. Our policy aims to ensure that no job applicant or employee receives less favourable treatment on the grounds of gender, disability, ethnicity, religion or marital status. We guarantee an interview to disabled candidates who meet the essential criteria. Practicing Law graduates and Public Health Professionals are strongly encouraged to apply. Applicants from low income groups, and those residing in remote areas are also strongly encouraged to apply. Last Date to Apply: September 23, 2018.